Happy Feast of St. Augustine! I can't promise free stuff every Friday, but it's become a bit of tradition and I'll keep it going as long as possible. Get a free Hallmark Connections sample greeting card. (click "Get a Free Card"). And, this is the last month for free chocolate. Only on Fridays. I tried to give you a free picture of my husband, but he said, "That's kind of like when good Catholic girls swoon over Bl. 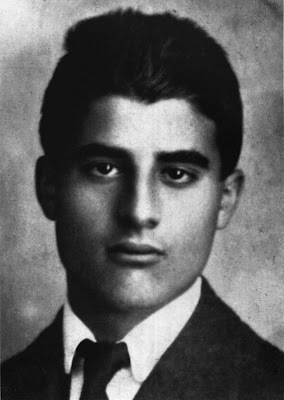 Pier Giorgio Frassati -- it just isn't right." Mm hm. My dear woman, I absolutely love you and your writings. SO much. And, well, in response to the whole Bl. Pier Giorgio swooning thing, holiness SHOULD be attractive. Your husband's going to want your little girls falling in love with men like him, who will climb a mountain, smoke a pipe with the guys, treat everyone with love, give with a generous heart, love purely, and insist upon saying his prayers before heading to sleep, no matter how tired he is. I say, swoon away, ladies, and may Blessed Pier Giorgio strengthen us in our faith walk and pray for us (and our husbands/boyfriends/childrens' spouses, etc.)! LOL... I don't think the attractive holiness is what he doesn't like 'em swooning over... I think it's the "look at his dreamy eyes!" from the most obsessed Frassati Fan (friend of yours).